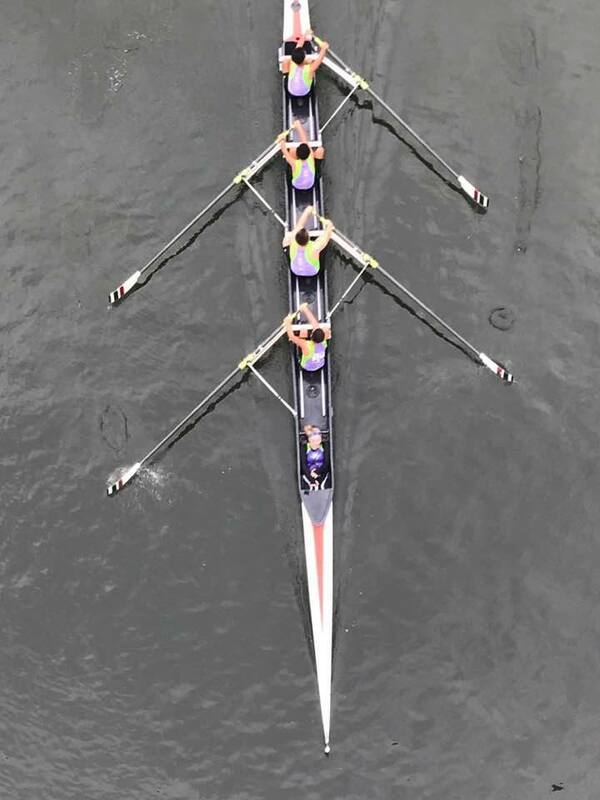 Rocket City Rowing competed in the 25th annual Chattanooga Head Race on the Tennessee River in Chattanooga, Tennessee along with 19 other youth, collegiate and masters teams from throughout the Southeastern United States on Saturday, October 14. 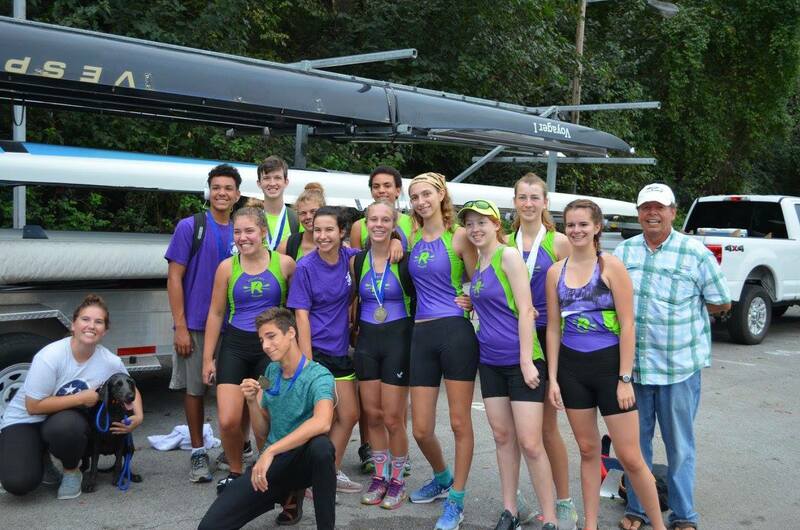 RCRC entered 15 boats in all boat classes except the 8+ and 12 boats won medals – 6 gold, 3 silver, and 3 bronze. Congratulations to all! 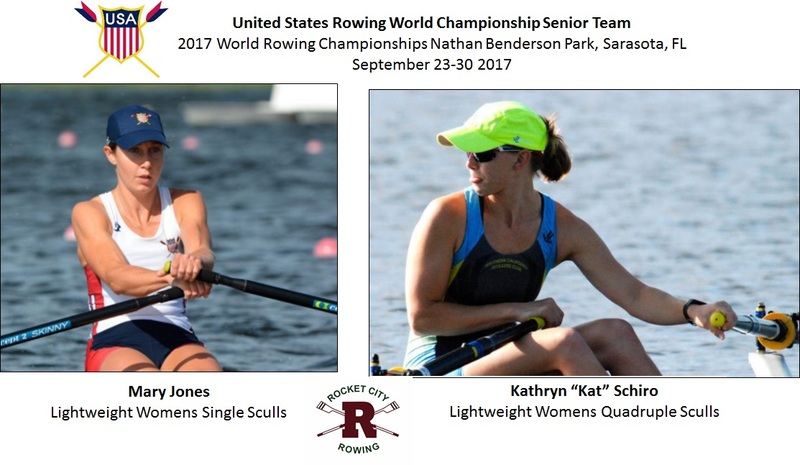 Rocket City Rowing has not just one, but two junior alumnae rowing on the US Senior Team at the 2017 World Rowing Championships that will be held September 23-29, 2017 at Nathan Benderson Park in Sarasota Florida. This will be the first international rowing competition held in the United States in over 20 years. Additionally, this year will be the first World Championship in the new quadrennium, as U.S. crews build towards the 2020 Olympic Games. Mary Jones Nabel, currently rowing out of Cambridge Boat Club in Boston, Massachussetts, is a veteran of 3 Senior Teams (2014, 2016, and 2017) and 1 National Team (2015 Pan American Games), will be rowing in the womens lightweight woens single sculls. 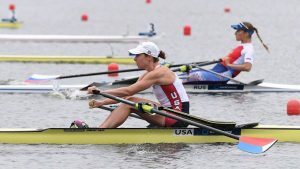 She spent this summer competing in Europe at World Cup II in Poznan, Poland (early June), the Holland Becker Regatta in Amsterdam the Netherlands (late June), and World Cup III in Lucerne. Switzerland (early July). She will be joined by Kat Schiro on her first senior team after being on the 2014 U23 team. Kat who is currently rowing with the Schuykill Navy out of Philadelphia, Pennsylvania will be joined in the quad by three other Schuykill Navy rowers in the lightweight women’s quadruple sculls. We wish them both them both some great racing experience! Tickets can be purchased at https://tickets.wrch2017.com/. Use code 776 and 10% of your ticket will be donated to Rocket City Rowing to support our rowing programs in the Tennessee Valley! Be Like Mary Jones – Become A Champion! Mary Jones, US National Team Lightweight Single Sculler, learned to row with Rocket City Rowing as a junior at Grissom High School. Follow in her oar puddles at our Youth Learn-to-Row Camp! July 24-29 Camp Fee – $125. This past weekend, June 24-25, Mary Jones Nabel represented Cambridge Boat Club (Boston, MA) at the Holland Beker International Regatta at the Brosbaan, the Netherlands for the top-billed Ladies Trophy event. This was the 124th Holland Beker Regatta which is one of rowing’s longest running regattas, stretching back to its roots in 1886. As a lightweight rower competing in an open-weight event, Mary had an exciting series of races. She qualified for the semi-finals out of the heats by finishing second by .36 seconds behind Emma Twigg (Hawkes Bay Rowing Club, New Zealand), an A finalist in the 2016 Rio Olympics and 2016 Ladies Trophy Champion. 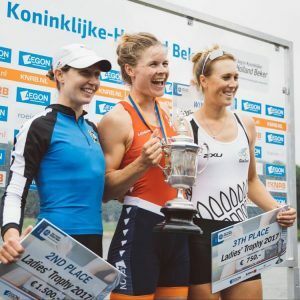 The semi-final on Sunday morning brought another second place behind Inge Jansen of the Netherlands, silver medalist in the women’s 1x at the World Cup II Regatta in Poznan, Poland on June 18. In the final, Mary showed amazing toughness through the whole race as she was compelled to a higher stroke rate than her much taller rivals. While the commentators and spectators were awaiting a strong sprint the end by Emma Twigg, Mary doggedly pursued Inge Jansen to finish second but 3.7 seconds ahead of Emma Twigg in third. She received a prize of 1500 Euros for her efforts which may go to a celebratory ice cream before her final preparations for World Cup III Regatta in Lucerne, Switzerland July 7-9. We have amazing nationally competitive collegiate rowers here in Huntsville! 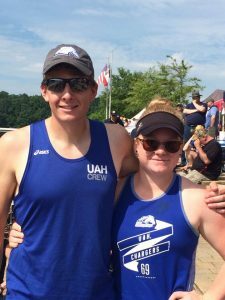 UAH rowers Kevin Cardno and Irene Thorpe won gold and silver medals Memorial Day weekend at at the American Collegiate Rowing Association (ACRA) National Championships at Lake Lanier Olympic Park in Gainesville, GA on Sunday. This is the national championship regatta for collegiate club rowers. Over 300 entries from sixty eight colleges from New England to California rraced 2,000 meters down the course. UAH senior and RCRC junior assistant coach won the gold medal in the Mens single by 13 seconds. Irene Thorpe, UAH junior and junior assistant coach at Huntsville/Madison County Rowing and Watersports finished second more than 17 seconds ahead of the third place boat from the College of William and Mary. Kevin’s outstanding performance in the single over the past two years has been noticed by the developmenl coaches for the U.S. Senior National Team. He has accepted an invitation to row for the summer with the New York Athletic Club (NYAC) sculling program where this largely self-coached athlete will experience NYAC’s nationally recognized coaching staff, and the opportunity to train and race with a highly competitive group of dedicated athletes. 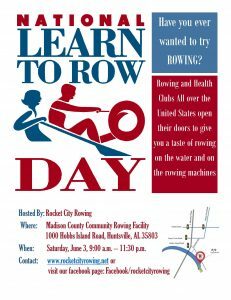 – Learn about programs offered by Rocket City Rowing. The introductory rowing experience culminates in an in-the-boat rowing experience in an “eight” with an experienced coach to guide you (weather permitting).